I miss the timeless style and classic beauty that inspired this photo. Women knew how to dress and Grace Kelly and Audrey Hepburn were the style icons you looked up to. I tend to think fashion peaked in their era. It seems a lot LESS fabric is worn now a days if you know what I mean. I will be donning some 1920's wear this weekend for a murder mystery surprise. Will make sure a share the photo on the fan page ;) Happy Weekend! love love LOVE this color. And the swimsuit from J.Crew! ooo I love this color!!! PS. Hope you & your little lady are doing well!!! this was a major eye candy page for me! LOVE!!! How delish! I love green. Beautiful! Love the swimsuit. Oh, who am I kidding. I love them all! I love jade jewelry! And I've always wanted to do one of those murder mysteries. :) Have fun! These are all beautiful! I am obsessed with all colors of Hunter boots....and the J Crew bathing suits are always beautiful! teal is amazing. one of my favorites. I just love the boldness of it. Oh I just bought a black 1920's inspired bathing suit today for a party in early June! I was wondering how I could accesorize it! Thanks for the pic! Beautiful! I completely agree. The cuts for women in clothing were all around flattering and feminine in that time! Ooh yes, I am digging this board! Great color! I think I want that swimsuit! Thanks for stopping by my blog! Glad you like it! and i just noticed: thank you, oh-so sincerely, for including me in your 'morning reads' that means alot coming from an amazing blogger like you! I agree, classic beauty will never go out of style! 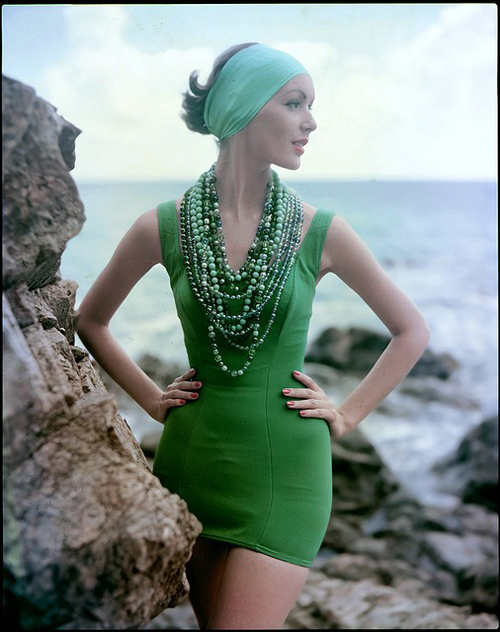 I love this shade of green too - that bathing suit is fab. ohh i love this colour inspiration!! the swimsuit is super cute!! that swimmer is fab--sorta want it:) love jade as well--it is reminding of me of the jadeite cake plate i have been lusting over:) have fun at the murder mystery--sounds fun! happy weekend! I love the demure classic look. Great colour! Jade has ALWAYS been my favorite shade of green! It's just so stunning!! Just forwarded this to a friend who loves this color! So gorgeous! This color is so gorgeous and I can't wait to see your costume! Loving BOTH of the bathing suits!! One pieces are HOT! ah one of my all time favorite colors. I think you're totally right, both about the jade colour and the classic style that now eludes us. Have fun at your party. They're so fun! i am not a huge fan of green and though…with a blue tuoch it´s not sooo bad! This color makes me happy :) LOVE your ensemble! oh I love the green rainboots! you're so right about that era, those ladies had it all going on and i love your inspired jade selects. i'm partial to greens too, my fave is kelly, especially with dark denim. Oh you blog is gorgeous, so happy i found you! Beautiful choices, nothing beats the styles of back then!! Happy Weekend, Anna! 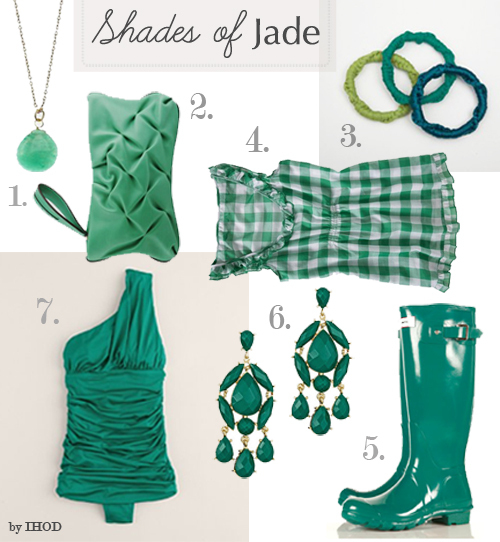 Jade is such a stunning color -- I think I need to get myself at least one dress in that shade for the summer. Maybe two. Such a gorgeous color! I'm loving those earrings! That sounds like such a fun weekend...adore the green and the suit is fabulous!! This is green love at it's finest!!! I am in love with jade! And totally agree with you about Grace Kelly and Audrey Hepburn, they had such timeless style. jade is such a pretty shade!! This post has left me speechless. gorgeous roundup! i adore the deep color! xoxo jillian :: enter to win my DIY bridal giveaway! I'm loving this color! So pretty!